I’ve been trying to buy a knitting stitch pattern book for months and just couldn’t find one I liked. I wanted one with diagrams as well as words to describe the patterns and nice pictures. It is one of the reasons why I’m so frustrated at the lack of knitting books in my local bookshops as I wanted to look at a pattern book before I buy it. But a lot of the pattern books I was interested in were only available on Amazon or in America. Last Sunday I went for a little wander around the shops as it was too wet and muddy to go for my usual walk along the river and lo and behold what do I find in TK Maxx (an English chain that sells cheap everything from clothes to household items)? 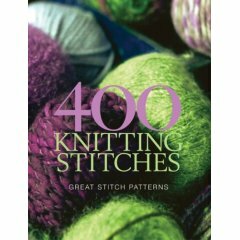 Yes you guessed it one copy of 400 Knitting Stitches by Murdoch Books for a measly £4.99. It isn’t exactly what I wanted but for less than a fiver I wasn’t going to leave it on the shelf. What I do like about it is all the knitting patterns swatches are all knitted in cream yarn so I don’t favour a particular one because it’s purple or dislike one because it’s and icky yellow or something. I view them fairly and without favouritism due to the colour. Demeter is almost finished, I’m about 75% along the lace border at the bottom but I’ve had a stupid cold the last couple of days and haven’t knitted at all. I picked up the spiral socks last night though and knitted a few rows so I think I’m feeling better now. …. arrived in the post this week. I ordered it for myself right before Christmas thinking it would be a lovely thing to receive during the January blues and I was correct. It was waiting for me when I got home from work on Wednesday and really made my day. 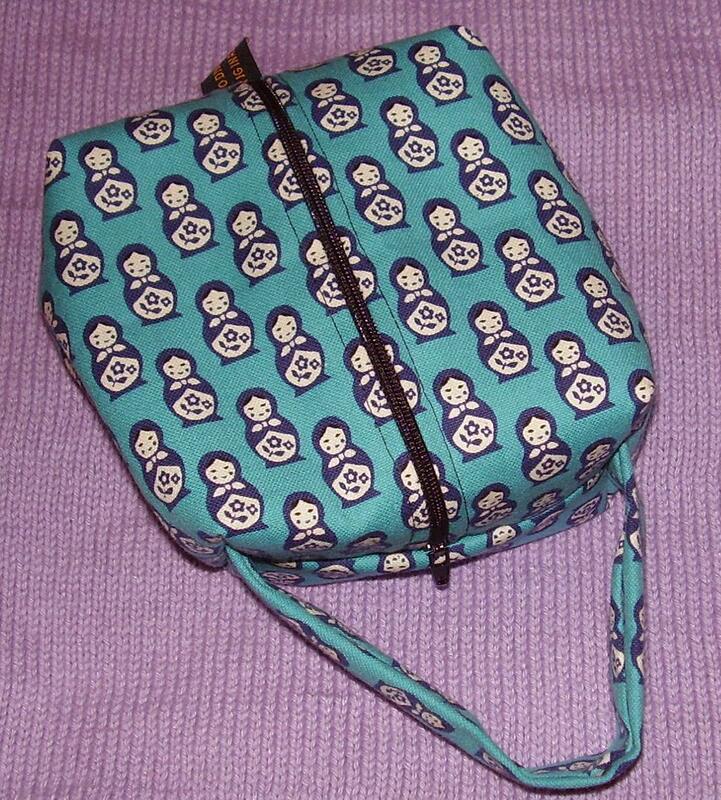 It’s a lovely cube bag, made by Schrodinger who’s shop is here if you would like one too. I’ve been reading Schrodinger’s blog and coveted one of these cubes for a little while and then just before Christmas she made new ones in this wonderful Blue Matryoshka (russian nesting dolls) fabric and I could resist no more!! It’s just big enough for a small project and I even managed to get my demeter camisole in it as it was on circular needles. How great are these two fabrics? 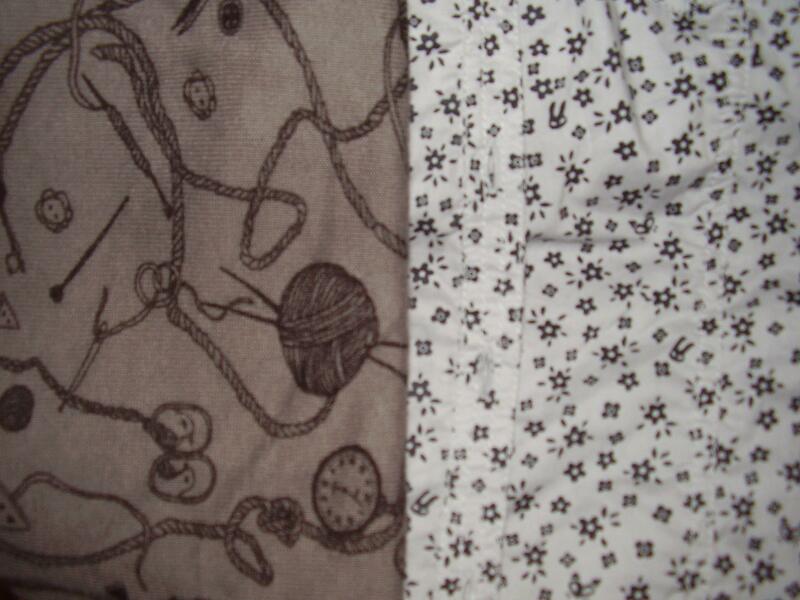 The one on the left is a knitted t-shirt with a pattern of craftiness all over it and the righthand one is a cotton shirt with flowers all over and if you look closely – the occasional rabbit and fox. I spent the day in Bournemouth and managed to get some real bargains, aswell as these two I got some black trousers for work and a grey pinstriped waistcoat. The shirts were from H&M Hennes which is a fantastic shop. I also spent an age in Borders looking at knitting books as I’m fed up with not being able to look at them before I buy them on Amazon and my local Waterstone’s have the most dismal collections of craft books ever. It’s extremely frustrating. I live in Salisbury and we have at least 7 quilt groups, a branch of the Embroiderer’s Guild, a beading group, a lace making group, and at least a bus full of knitters (we all go to the knitting and stitching show together every year) , which is a lot of crafty people in one small city. But the craft sections in Waterstone’s do not reflect this. It’s no wonder people buy books on Amazon all the time. Last Saturday I counted the knitting and crochet books and there were 3 knitting and 5 crochet. Borders in Bournemouth had at least 3 shelves FULL of knitting/crochet books and a whole bookcase of craft books. I didn’t buy any but it was great to have a proper look at some of the new books I’ve heard so much about. 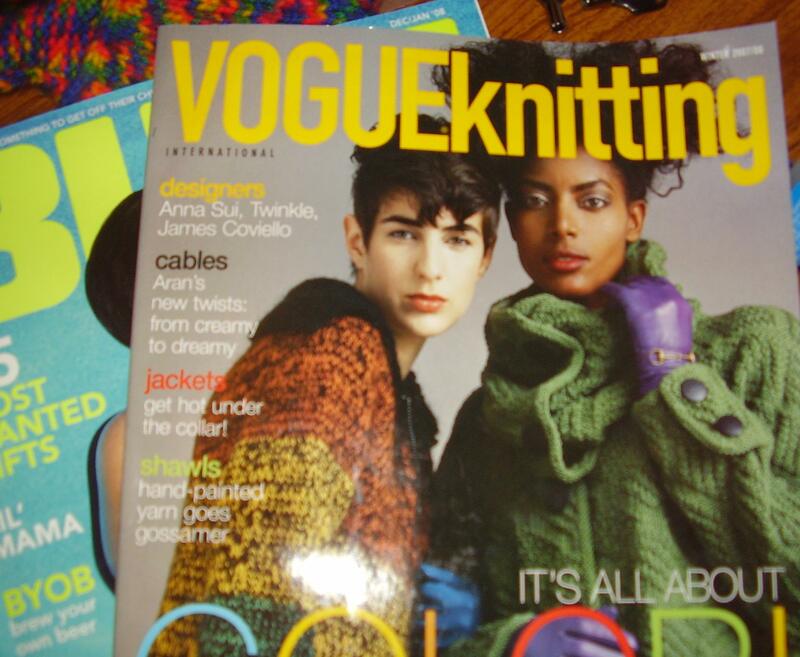 I did buy Bust and Vogue Knitting magazines and am looking forward to reading them tomorrow. But does anyone know of a craft book shop in the UK, or an LYS with a great book section? Please let me know if you do. Look at my progress!! I can’t believe how quickly I’ve knit this so far. I need to finish knitting the front right strap, graft the shoulders together and then pick up the stitches at the bottom edge (currently on a provisional cast on that you can’t see in the picture) to knit the lace edging and then bob’s your uncle – one finished Demeter Camisole. I intend to start the lace edging tomorrow but first I have to investigate if I can unravel an inch or two at the bottom as my body is shorter than the patterns. If not, it’ll just be a long camisole and I’m perfectly ok with that. I’m knitting like the wind at the moment, Demeter is 96 rows in I’m past the waist shaping and 30ish rows away from dividing for the shoulder straps. I’ve printed off the errata on the lace border for the bottom so I’ll be ready to go with that when I get there. I may try the lace pattern on some spare yarn to make sure I’ve got the hang of it before I do it on the actual top (well bottom of the top!). I’ve posted the Calorimetry hat to Keirsten and by the look of the weather this week, she’s really going to need it. The weather in the UK at the moment is awful, very wet and windy with lots of flooding in the south west. 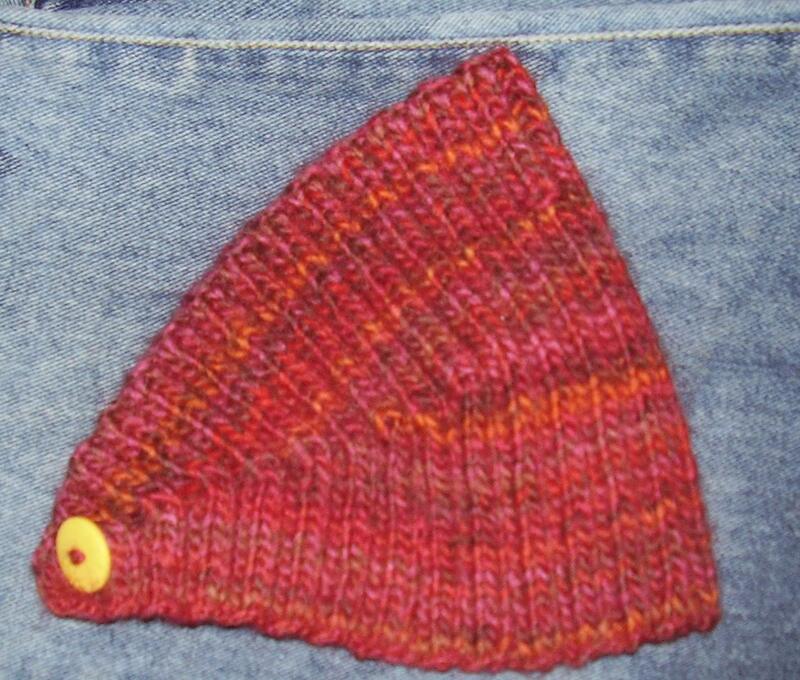 I will post pictures of the hat later in the week but the red yarn didn’t photograph well which is a shame as it’s a lovely colour. Update 20 Jan: Added pic as it came out much better than I thought and you can even see the nice colour of the button! So how was everyone’s first week back at work? Mine was quite dull, it was really difficult to be motivated. Partly because the weather was very gloomy and dull – I think the sun only came out two or three times and partly because it’s that post-Christmas-nothing-much-to-look-forward-to-spring-feels-so-far-away time. I did try to be positive and think that the nights are getting shorter and it’s lighter for slightly longer but it feels so miserable getting up when it’s dark and getting home from work in the dark. I have been knitting all week though! I started the week by doing some more of the legs on the Tofutsies “I hate this colour” socks, and then decided completely out of the blue to knit a Calorimetry Hat for my friend Keirsten as I love the pattern (I knitted it twice last year) and I had a ball of Twilley’s Freedom Spirit in a red/orange/brown shade (Fire 502) that I couldn’t use for myself as it makes me itchy. Also, the Calorimetry hat is designed for people with long hair so they can keep their head warm whilst wearing their hair tidied back and as I no longer have long hair I can’t really wear one now. Anyway, I cast on on Sunday night before bed, and then knit through my lunchbreak on Monday, knit Monday evening for awhile (I also took down my Christmas decorations and tree) and then knit on Tuesday at lunch and finished it in the evening. I think it probably took me around 3-4 hours to knit and I love the way the colours have turned out with the short row pattern. This morning I found a yellow button to bring out the orange tones in the yarn and when I’ve sewn it on I shall send it to K in Bristol so she can keep her head warm on the way to work! Then on Tuesday evening I decided I liked knitting at work on my lunch as it was a really nice break from work (which I don’t really enjoy) and something to look forward to all morning, so I cast on for the Demeter top by Miriam Felton in the Sensual Knits book . The Transparency jumper hadn’t progressed since New Year’s Eve and I think it’s because I’m not fond of knitting with mohair so I’ve put it on hold temporarily. 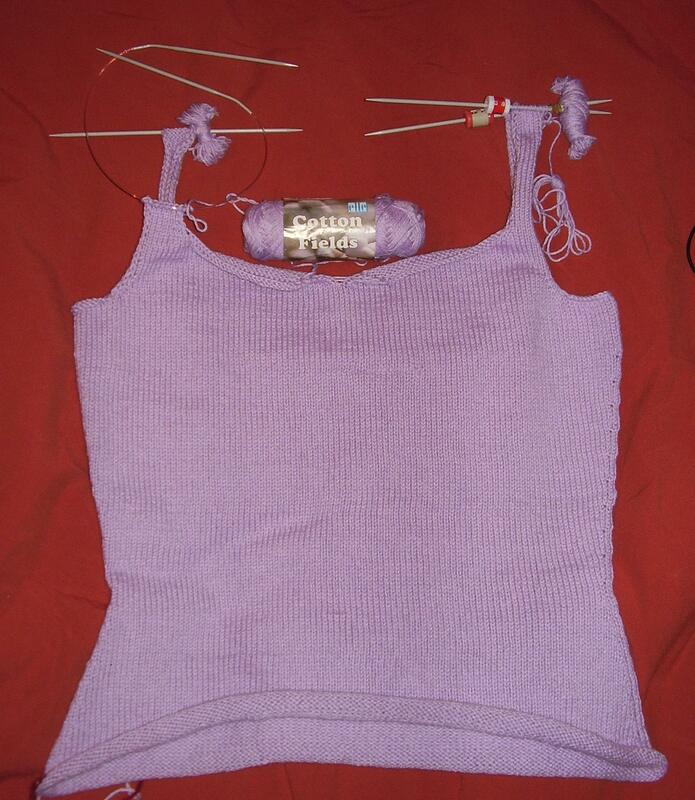 I had some lilac Elle Cotton Fields DK in my stash so I grabbed a 3.25mm circular and knitted a bit to see what the gauge would be and then matched it to one of the vest/tank patterns in the Sensual Knits book. The gauge matched the Demeter pattern and SURPRISE!! the measurements on the schematic matched my body shape so I quickly learnt how to do a provisional cast on and it was all systems go. I have almost knit to the waist and it’s going well so far. I’ve knitted at work every day whilst listening to Cast On and although I only have time to do a few rows it’s lovely to switch off from work and be creative. P.S. I bought 6 balls of Sublime Baby Cashmere Merino Silk DK in shade Dilly (a moss green) in a LYS sale – 20% off this morning. Another friend is expecting a boy in April so it will be just perfect. This is the cushion my mum gave me for Christmas. Last year she went to a workshop which needed several different fabrics in the same colour so she used some of the purples in her stash. Mum tends to buy purple because I LOVE PURPLE and when she made this she asked if I would like it. 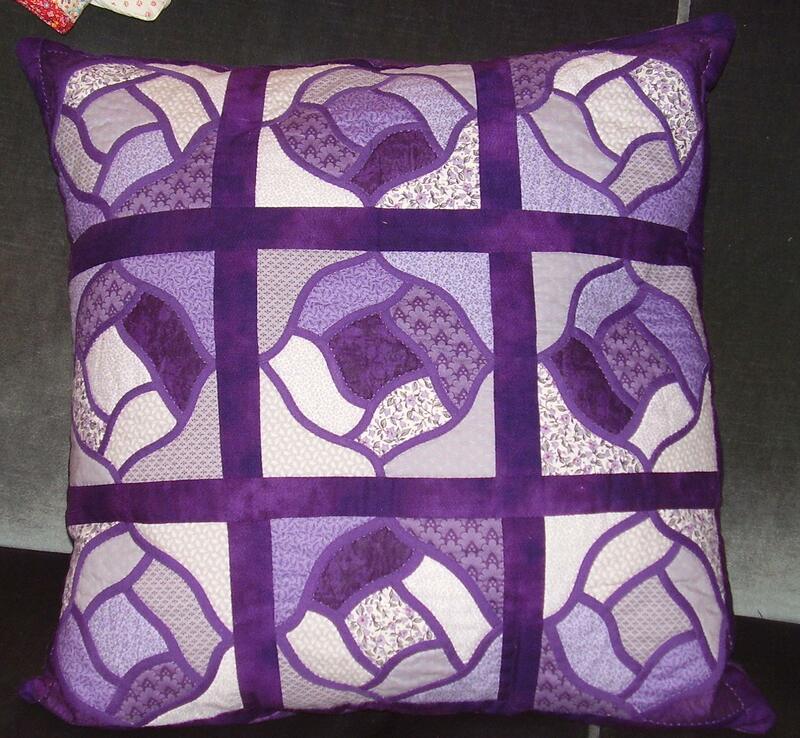 Originally it was going to be a small quilt or hanging but I already have a small purple quilt on my bed so I asked if it could be made into a huge cushion et voila!! It’s a feather cushion inside so it’s really comfortable and lovely for reading in bed. I will ask what the block is called as I’m awful at remembering quilty things. I went back to work on Wednesday and it was a real struggle as I don’t really enjoy my job at all, so consequently I didn’t do any knitting until last night when I picked up the funny colour socks again. I have knitted today and am just past the heel on the second sock now. Both socks are 8 rows up the leg from either end of the ball of yarn so I will continue with both to make knee highs I think as I need some to wear under boots.